Elmo Anywhere integrates with Glaxis RightGlass as an add-on feature. You must have the RightGlass Feature turned on and an active account with Glaxis. 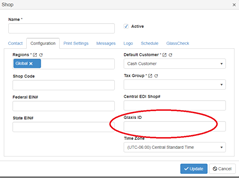 To input your Glaxis ID Navigate to Settings -> Configuration -> Shops. In the Shop editor, click on the Configuration tab and enter your Glaxis ID. Click the "Update" button to save changes. Navigate to the Quote or Order page. 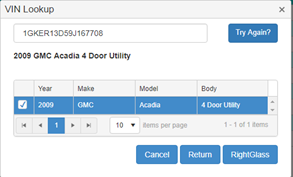 Proceed to search and select a vehicle using VIN Lookup. Refer to the VIN Lookup article for help. Once the vehicle is selected, you will see a new button for RIghtGlass if the feature is turned on. Clicking RightGlass will pop up a box asking for confirmation as each RightGlass transaction will cost $5.00. Note: If VIN has already been processed by RightGlass you will not be charged again. Clicking Yes will do a RightGlass transaction and return all parts for that VIN. A RightGlass tab will appear and in that grid, the parts for that VIN will be displayed. OEM and Nags part numbers will be shown for reference. Note: If any errors or no results are returned from RightGlass, you will not be charged. When a successful RightGlass transaction is processed, in the Vehicle Lookup grid, the correct windshield part will be noted with a star. If the part asks for Consult Dealer, the star will be red, otherwise it will be green. Each RightGlass successful transaction will save the Order and no data will be lost. Note: If the VIN has already been processed in RightGlass, when a user clicks RightGlass button it will do a free charge search for that VIN and return data as outlined above. Each Order will only show the latest RightGlass results in RightGlass tab. To view all RightGlass results and history, Click Reports on left menu and choose the RightGlass History Report. This Report will only show if you have feature turned on.